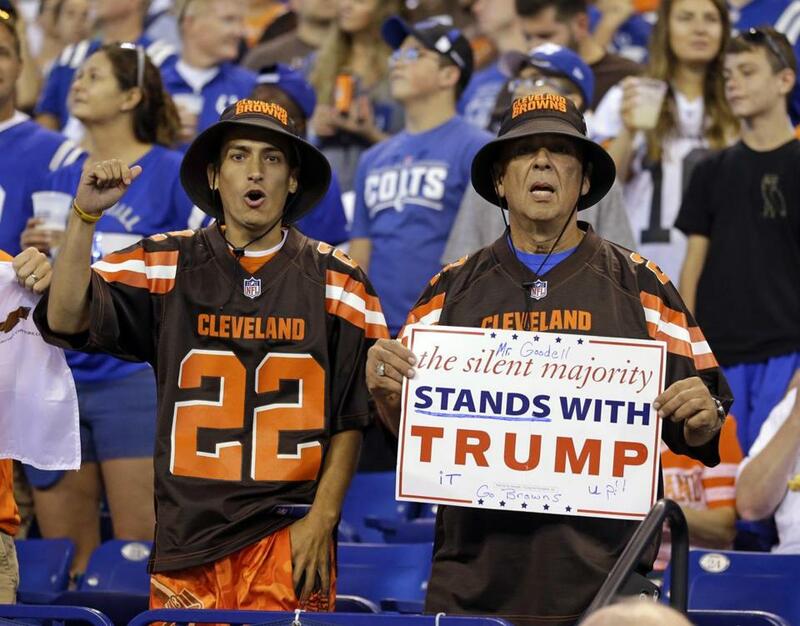 Cleveland Browns fans hold a sign after the national anthem at the Colts-Browns game on Sept. 24. Along with yoga and power naps, most Americans believe that a perfect way to escape from the stress of our daily lives is to sit back and watch a ballgame. That all changed this past week. Our country is stressed over President Trump’s fight with the NFL, which started as an off-the-cuff statement at an Alabama rally and ballooned into one more week of divisiveness among those who support Trump and those who don’t. The progressives I have interviewed are appalled at Trump’s SOB comments, his insistence on criticizing a peaceful demonstration of free speech, and as some believe, his racism. Steve Kerr, the head coach of the Golden State Warriors, made an impassioned plea, in Sports Illustrated, for the president to bring us together and not divide us. However, among the 400 voters participating in my research since last December, more than 40 percent are supporting the president. Many are calling for a boycott of the NFL this weekend, and it’s important to understand why. Among these voters, there are four reasons. People like Deborah want our president to be outraged about those who disrespect the flag. They used words like “despicable” and “a disgrace” to describe the Ravens/Jaguars game in London, where players took a knee for the national anthem and stood for “God Save the Queen.” In their eyes, football players and coaches made a mockery of our nation. The second reason is the NFL leaders’ hypocrisy. Trump supporters question why the NFL didn’t step in and prevent the problem in advance. They cite the case from July of 2017, when Dallas Cowboys tight end Jason Witten suggested wearing a helmet decal in support of Dallas police, after five officers were shot dead by a man who claimed he wanted to kill white people. The team wore the decals during practice, but the NFL rejected the team’s petition to wear the stickers during regular games. The NFL has also cited league rules in banning one player’s request to wear green shoes in support of mental health issues. If these displays are banned, they ask, why shouldn’t the NFL ban protests during the national anthem? Finally, they want players to be more responsible in how they protest injustice. “Why didn’t the players scream in protest against domestic violence when Ray Rice sucker-punched his girlfriend so hard that she lost consciousness for 30 minutes?” asked Ron from West Virginia. And rather than taking actions that divide the country and don’t accomplish much for those they are trying to help, people on Main Street want to see more genuine altruism from athletes. Kate from South Carolina said, “They could all make such a big difference. Maybe if they quit the knee B.S. and actually took the time to help some of those individuals who are so oppressed.” Added Sarah from Connecticut, “How about pouring some of that money back into the places they came from to make them better? Or take a stand against the gangs who are making our communities unsafe?” When I mentioned to Kate and Sarah that many NFL athletes spend significant time giving back to their communities, they responded that for all but a few players, these actions are just for appearances, and not truly impactful. They insist that millionaire football players have joined the elite and no longer can relate to middle America. Why did Trump even take us here? As a distraction from the other issues he’s dealing with, it’s ultimately ineffective. No one has forgotten about North Korea, health care, or hurricanes. More likely, Trump is doing what he has done for the last two years: forcing the Democrats yet again into a losing game of identity politics. Here the sense of community we get from Sunday football-watching diminishes, as people are more interested in who wins the take-the-knee competition than whether our team wins. In this game, everyone fights for their corner of the world instead of listening, asking, and learning from each other — preventing us from dealing with the complex issues facing our country. Diane Hessan is an entrepreneur, author, and chair of C Space. She has been in conversation with 200 Clinton voters and 200 Trump voters weekly since last December. Follow her on Twitter @DianeHessan.